Technological progress, besides being the main driver of economic growth, also has consequences for distribution. More often than not it is biased towards certain factors of production, and towards certain types of workers. There is evidence that job polarisation and structural change – two phenomena with important implications for the labour market – are due to uneven technological progress. Job polarisation is the joint increase of employment and wages in low- and high-earning occupations, relative to those in the middle. This phenomenon, widely documented in the US and several European countries since the 1980s, is believed to be largely driven by biased technological change for tasks at work. In biased technological change, information and computer technologies substitute workers in occupations more intensive in routine tasks (routine occupations) in the middle of the wage distribution, complement workers performing abstract tasks (abstract occupations), at the top of the wage distribution, while leaving workers in manual occupations at the bottom of the wage distribution largely unaffected (Autor et al. 2006, Autor and Dorn 2013). There have been significant changes of employment at the industry level as well. Developed economies have seen rapid reallocation first from agriculture to the goods-producing sector, and then from goods to the service sector. In the US, for example, while the goods sector accounted for 44% of total hours worked in 1960, by 2010 the share was just 21%. Published research on structural transformation typically explains these changes by pointing to differences in productivity growth across sectors. Goods and services tend to be complements in consumption, and on average labour productivity grows faster in goods than in other sectors, so supply outgrows demand for goods. This leads to a reduction of employment in the goods sector, and a rise in service employment (Ngai and Pissarides 2007). Most papers study job polarisation and structural transformation in isolation, but a few studies have connected the two. In an earlier study we showed that job polarisation in the US started as early as the 1950s, and was closely linked to the shift away from manufacturing (Bárány and Siegel 2018a). Several recent papers have suggested that biased technological change across occupations can lead to structural shifts across sectors (Goos et al. 2014, Duernecker and Herrendorf 2017, Lee and Shin 2017). These papers do not aim to identify whether the bias in technological change is at the occupation or at the industry level, but a priori restrict the nature of the bias. In recent work (Bárány and Siegel 2018b) we go a step further, and analyse what type of technological process could be behind both job polarisation and structural change. 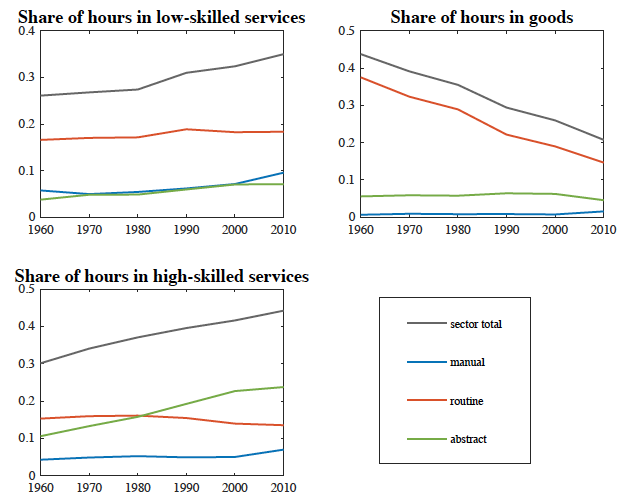 Figure 1 plots sectoral share in hours worked between 1960 and 2010 in the US, as well as a breakdown into occupational categories. Source: Authors’ calculations based on US Census and ACS data. The figure shows that the contraction in the goods sector’s employment happened exclusively through a reduction of routine employment, and that almost all of the decline in routine employment occurred in the goods sector. A similar pattern arises for high-skilled services and abstract occupations. These patterns highlight that there is a close connection between sectoral and occupational employment reallocations. They also show why it is difficult to identify the true nature of technological change. We develop a new approach to assess the degree to which technological change is truly biased across sectors and across occupations. A main challenge is that occupational productivity cannot be measured directly from the data, as output can only be measured at the level of the firm or the industry, not at the level of occupations. We overcome this problem by specifying a sectoral production function for which occupational labour is combined with a constant elasticity of substitution to produce each sector’s output. We assume that productivity growth is specific to the sector-occupation cell, which allows us (using first-order conditions) to infer the labour productivity of each cell, in each period, from the data. This flexible approach captures the possibility that technologies are linked to the job that workers do, where a job is defined by both the sector and the occupation of the worker. Note that when we assume that productivity evolves at the sector-occupation cell level, it does not rule out common trends in technological change, for instance at the sector or at the occupation level. overall growth in GDP per worker, which reveals changes in productivities over time. We then look for common factors in technological change to estimate the extent to which productivity growth is specific to certain sectors (after controlling for the role of occupations) or to certain occupations (controlling for sectors). We find – for a wide range of values for the elasticity of substitution between different occupations – that between 75% and 80% of productivity changes can be explained by sector-specific and occupation-specific productivity growth jointly, and that hardly any (less than 2%) is attributable to general purpose technologies (or TFP growth). Further we find that of the 75-80% jointly explained by sector and occupation factors, most is due to occupation-specific factors, with a relatively small role for sectoral differences in productivity growth. Finally, we want to understand the contribution of these factors to the observed path of outcomes of interest, including occupational and sectoral employment, occupational wages and sectoral prices. In order to assess the role of these components, we close the model by assuming that households choose their sectoral consumption and individuals choose their occupation optimally. We then run counterfactual experiments, shutting down various components of productivity growth. We find that for the evolution of sectoral prices both occupational and sectoral differences in productivity growth are important. For employment and wages, we find that while both sector and occupation components imply qualitatively the same change as in the data, quantitatively the sectoral bias falls short, and by far most is explained by occupational differences in technological change. Our analysis is a first step towards evaluating policies in rapidly changing labour markets. Recently, much of the political debate has focused on active labour market policies (such as training programs), and on protectionist policies intended to maintain employment in particular industries. Our model has no frictions or externalities which could justify these policies, but our results shed light on the importance of technology in the economy and attribute a large role to occupation-specific changes. These findings imply that, for improved labour market outcomes, policies targeting occupational choice for workers might be better than industrial policies. Autor, D and D Dorn (2013), "The Growth of Low-Skill Service Jobs and the Polarization of the US Labor Market", American Economic Review 103(5): 1553–97. Autor, D, L Katz, and M Kearney (2006), "The Polarization of the US Labor Market", American Economic Review 96(2): 189–194. Bárány, Z and C Siegel (2018a), "Job Polarization and Structural Change", American Economic Journal: Macroeconomics 10(1): 57–89. Duernecker, G and B Herrendorf (2017), "Structural Transformation of Occupation Employmen"t, 2017 meeting papers 1239, Society for Economic Dynamics. Goos, M, A Manning, and A Salomons (2014), "Explaining Job Polarization: Routine-Biased Technological Change and Offshoring", American Economic Review 104(8): 2509–26. Lee S Y and Y Shin (2017), "Horizontal and vertical polarization: Task-specific technological change in a multi-sector economy", NBER working paper 23283. Ngai L R and C Pissarides (2007), "Structural Change in a Multisector Model of Growth", American Economic Review 97(1): 429–443.